A few days ago, we read about the news of Ch1na Airlines (if I may add, the Ta1wanese one) decimated yet another plane. Considering their penchant of losing planes, I wonder what the shareholders were thinking when they invested in this company with the affinity of throwing away money? It's a real pity considering the fact that they have the potential to be a good airline. Somebody upstairs is obviously not steering the ship right. Anyway, got this in the news where the ill-fated CI120 Ch1na Airlines B737-800 had undergone a big cover up that involved a lot of Liquid Paper. Apparently, with the permission of the local authorities, they Tipp-Exed the logo away. Oh come on! It was all over the news and you think this is going to hide? Oh Puh-leaze!!! Well, I for one am not going to let them get away with this and pretend this never happened. So there. I put the picture up big big. On another note, I noticed a comment at the bottom of the Jaunted article where reader "egw", sarcarsticly joked that "they should have used anti-freeze filled toothpaste" instead, obviously taking reference from the recent mass recall of toothpaste of Spitland origin, laced with diethylene glycol. Well, for the unintiated, I will say this again. Ch1na Airlines is Ta1wanese and not to be confused with Air Ch1na (Spitland's national carrier) which is a totally different airline, which if I may proudly add, the latter was 39 places higher in the 2006 Airline Accidents Ratings. Yes, Spitland has, in recent months, given people a bad impression, be it tainted pet food, tainted toothpaste, blankets with formaldehyde exceeding safe levels, or medicine with overly high traces of mercury and/or lead, or toys with too much lead in the paint, etc. Still, it doesn't give anyone the right to blindly point the finger at Spitland, whenever there is a screw up, without first verifying the facts. Unfortunately, it is an uphill task in a world where the average person lacks a sound foundation of good general knowledge. OMG! You still use one of these "liquid-paper"! Erm, I think it's a figure of speech only leh. 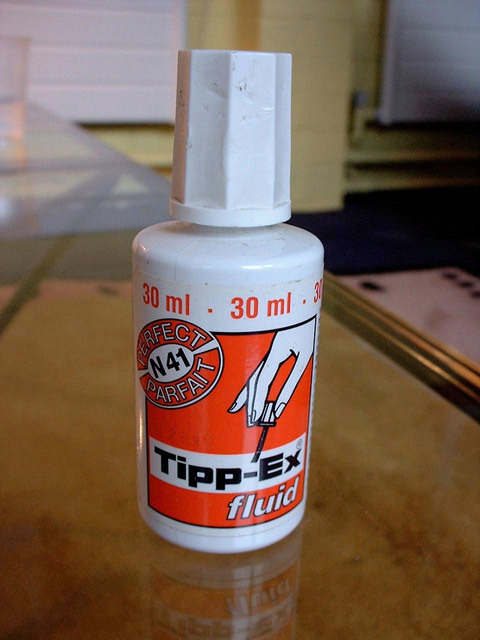 Anyway, see that Tipp-ex brings back lots of memories! If we ever go to Taiwan, we better not take China Airlines! P.S How come you spell China with a 1? Is it to escape Spitland internet control?? Nowadays want to find the nail polish type also don't have liao lah. Ed: Don't forget the other Thinner bottle also. You are right about the weird speowling. As all internet traffic has to go thru the Great Firewall of Ch1na or what I call the Spitland Internet Gestapo (SIG). Better to stay below the radar than the kena flag by the bots for sensitive keywords. Jay, i dont think China Airlines will slide down the rankings based on this event, as it is not fatal, not up in the air yet, and the passengers escaped unscathed. I donno, maybe i could be wrong. Gary: You are right about them not sliding further down the rankings as a result of this incident. THAT'S BECAUSE THEY ARE ALREADY AT THE FRIGGIN' BOTTOM!! If you read the ranking list properly hor, there are only 87 airlines listed. Now go see where our dear Ch1na Airlines is listed. one of my classmates say tat her co. still using tis kind of liquid paper leh. Aloe: I supposed it really doesn't matter if it were the old "nail polish" type or the more modern steel-tip pen model or the white strip model. As long as able to do what it is meant to do, I am happy liao. u power..... how come u din ask the teacher for a new sheet of paper?! LOL! Aloe: This one is tutorial and our F-maths solutions can stretch to as many as 3 pages coz we have to show all the workings. I can't change sheets coz sometimes the mistake is smack in the middle and too lazy to have to recopy the entire chunk, considering the fact that you also not sure if you are going to get it right the second time round. Its abit annoying after a while to keep hearing people who keeps warning me about eating china food and such. I will go broke if I have to go all imported and organic. It's hard to run away from china products (even fresh food from china). Like what a Chinese trade official said, this is just one tree in the whole forest. Frenie: There is an old saying, "Lup Sup Jiak, Lup Sup Dua" which literally translate to "Dirty Eat, Dirty Grow". I supposed if you are accustomed to rubbish, you are ironically less likely to fall ill. I supposed the typical Singaporean live in a place where it is too clean to the effect that the slightly dirt will have him/her scrambling for the toilet.